This is a desert succulent from the Crassulaceae family. It's sometimes called Hen and Chicks, although several species go by this common name and it can be difficult to tell these succulent plants apart. 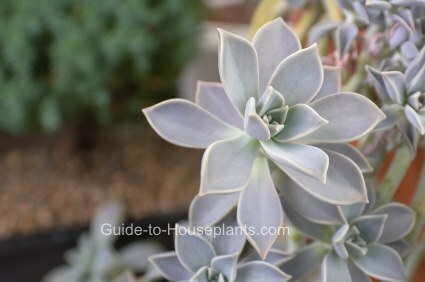 All echeverias grow in a rosette 2-6 inches (5-15 cm) across on short stems. The rosette has fleshy, blue-green leaves that become tinged with red when exposed to sun. Handle it with care because the leaves break off easily. Echeveria fimbriata (shown above) has an upright, rosette form with leaves that often turn purplish-green. 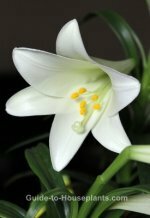 You can expect it to bloom in late summer with red and orange flowers. E. elegans (pictured at right) is a popular species. It has a beautiful rosette form with tall spikes of bell-shaped blooms on pink stems appearing in summer. Pinch them off when flowers have faded. Countless varieties are available to choose from. Choose any you like -- they're all easy to grow. Several species look spectacular in a dish garden growing together, or combined with other succulents. Trying to identify echeveria? 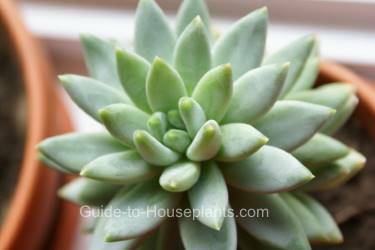 Start with this echeveria list of pictures with species names. You'll discover lots of information about these beautiful plants, too. This is a plant that grows quickly. In fact, this succulent house plant produces offsets -- called chicks -- in abundance. If they get too crowded in their pot, cut them off and propagate them. Give it a rest in winter. Cut back on water and provide cooler temperatures -- a cool, sunny room is ideal. Light: Bright light with some direct sun. You can move this sun-loving succulent outdoors for the summer, be sure to bring it back indoors when nighttime temperatures drop to 55°F/13°C; it's not cold-hardy. Humidity: Average to dry room humidity (40-50% relative humidity or lower). Temperature: In spring and summer, average to warm 65-80°F/18-27°C. Slightly cooler in fall and winter 55-75°F/13-24°C. Fertilizer: Feed every 2 weeks spring through fall with a 2-7-7 liquid fertilizer diluted by half. Propagation: Offsets can be cut off and potted in their own containers. Leaf cuttings can be propagated in spring and summer. Allow leaf to dry for 24 hours to stop the oozing of its sap. Push the cut end into moist potting mix. 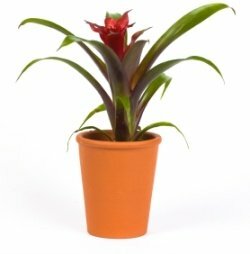 Do not cover the pot with plastic because succulents are likely to rot with excessive moisture.